Saul Gorn was born in 1912. Originally a military and then civilian researcher for the Army and the Air Force, Gorn worked with both ENIAC and EDVAC at their later homes at Fort Aberdeen, Maryland. Hired by the Moore School as an Associate Professor in 1955, Gorn convinced the University administration to start a facility not just for research about computers but for research in other fields using computers. 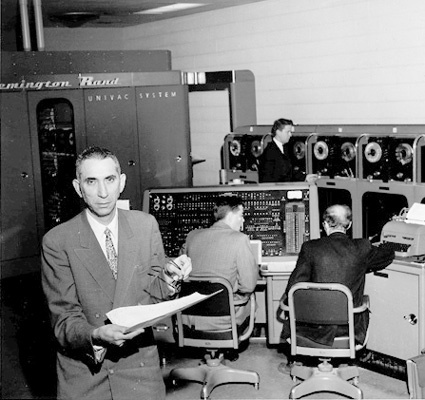 Fortunately, the University recently had received the donation of a brand new UNIVAC I computer from the Remington Rand Corporation, which had bought both the services and the company of ENIAC’s creators, J. Presper Eckert and John W. Mauchly. The Trustees of the University were wary of the fiscal hassles of operating the computer, but University President and physicist Gaylord P. Harnwell knew that the University needed a powerful computer for research in economics, physics, and engineering. Harnwell asked a prominent University benefactor, Louis Stein to raise money for a “University Computing Center” later called the University Computer Center and appointed Gorn to run it. During Gorn’s tenure, the UNIVAC I was used for research in linguistics (human and computer), business operations, physics, and even the analysis of medieval texts. Gorn returned to full-time research and teaching in 1961 and became Professor of Computer and Information Sciences in 1964. He was a strong proponent of computer science as an academic discipline and formed bonds of interdisciplinary cooperation between the Moore School and the Departments of Mathematics, Psychology, and Linguistics. His greatest achievement in research was his theory of mechanical languages which connected concepts of computer languages with the work of philosophers of human linguistics such as Wittgenstein. He retired from the University in 1983 and died in 1992.